One of summer's most colorful trends has been pineapple attire. Pineapple T's, pineapple skirts, pineapple earrings. 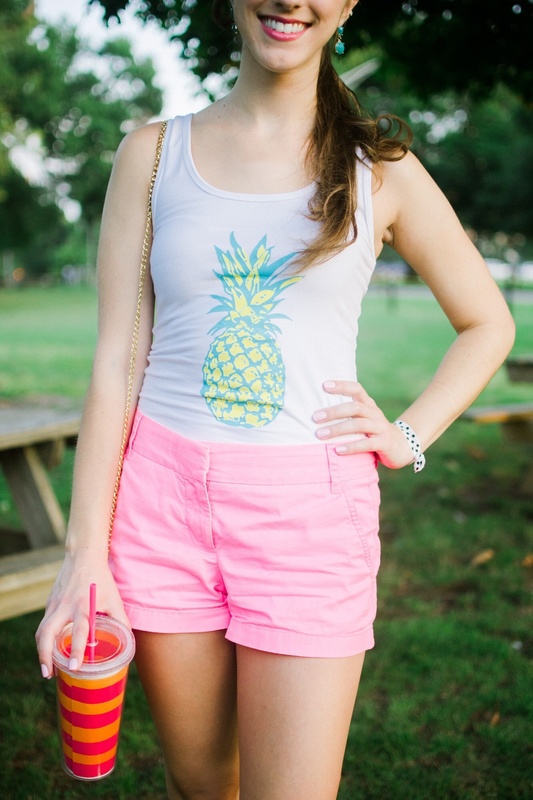 That's why I was so excited to see this neon pineapple tank from Style Lately! I love the vibrant blues and yellows in this tank, and decided that it needed to be paired with equally colorful accessories. Pink, as always, was my color of choice. Combining it with bright pink J.crew shorts, a pink and orange Francesca's purse, a pink and orange striped Kate Spade tumbler, gold Jacks and my pink and blue Lilly iPad made it the perfectly girly casual Summer outfit.